What is a 90% Furnace? 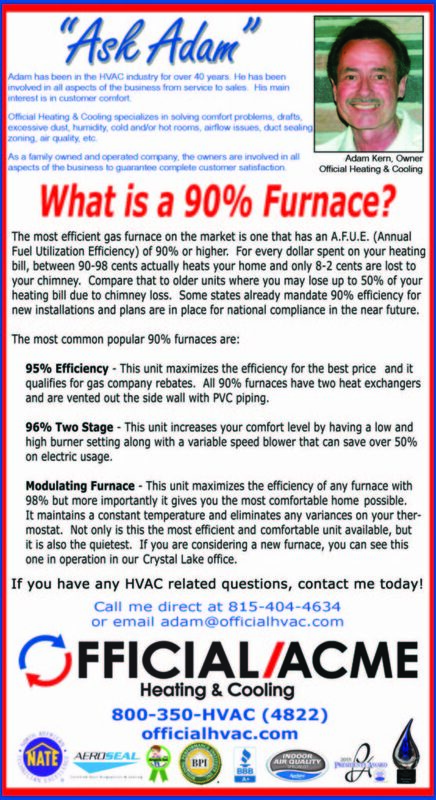 A 90% furnace has an Annual Fuel Utilization Efficiency of 90% or higher. The most efficient gas furnace on the market is one that has an A.F.U.E. (Annual Fuel Utilization Efficiency) of 90% or higher. For every dollar spent on your heating bill, between 90-98 cents actually heats your home and only 8-2 cents are lost to your chimney. So a lower rated furnace heats your home less and loses more. We can talk to you about any other question you have about 90% furnaces or schedule an appointment to install one in your home. You can also contact Adam at 815-404-463 or email adam@officialhvac.com. Looking for HVAC specials? Find heating and cooling specials here. You can also get in touch with the Official HVAC team by calling 815-220-5125 or our contact form! We do furnace maintenance and repairs in Woodstock as well as Crystal Lake, McHenry, and other areas.